World leaders promised to tighten border controls, step up intelligence sharing and crack down on terrorist financing at a summit in Turkey on Monday, but there was little sign of a dramatic shift in strategy against Islamic State in Syria. The G20 summit in Turkey's coastal province of Antalya has been dominated by Friday's suicide bombings and shootings in Paris, which killed 129 people and underlined the threat posed by the radical jihadist group far beyond its strongholds in Syria and Iraq. The two-day summit brings together world leaders including US President Barack Obama and Russia's Vladimir Putin just 500 km (310 miles) from Syria, whose 4-1/2-year conflict has transformed Islamic State into a global security threat and spawned Europe's largest migration crisis since World War II. "The horrific attacks in Paris on Friday night, so soon after the Russian airline disaster and following on from the Ankara bombings and the attacks in Tunisia and Lebanon, they underline the threat we all face," British Prime Minister David Cameron told a news conference. "We have agreed to take further important steps to cut off the financing that terrorists rely on, to counter the extremist ideology of the terrorist propaganda and to better protect ourselves from the threat of foreign fighters by sharing intelligence and stopping them from traveling." French warplanes pounded positions held by Islamic State, also known as Daesh, in Syria on Sunday. Foreign Minister Laurent Fabius described it as an act of self-defense following the Paris attacks. "France has always said that given the manner in which it has been threatened, not only threatened but attacked, by Daesh, it is completely normal that it takes the initiative and as an act of legitimate defense, takes action," he told reporters. Obama vowed on Sunday to step up efforts to eliminate Islamic State and prevent more attacks like those in the French capital, while urging Putin in an informal meeting to focus his military campaign in Syria on combating the jihadist group. US-led efforts to fight Islamic State were complicated when Russia joined the conflict a month and a half ago, targeting what the West says are mainly foreign-backed fighters battling President Bashar al-Assad, Moscow's ally, rather than focusing on Islamic State. 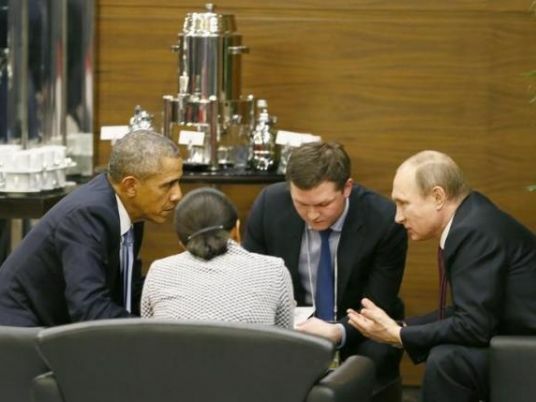 Kremlin spokesman Dmitry Peskov said on Monday the meeting with Obama had been constructive but not groundbreaking. Cameron, who also held a one-hour meeting with the Russian leader, said differences in opinion over Assad's future had been enormous but appeared to be narrowing. "There are big differences, we don’t hide those, we discuss them. But it is important in all these instances to have a proper dialogue with people like him," Cameron said. US officials said Washington wanted to intensify existing efforts against Islamic State, including the bombing campaign and arming Syrian rebels. Obama will meet with European allies at the end of the summit to try to shore up their common front. But the officials said there were no immediate plans for any dramatic shift in strategy such as the deployment of significant ground forces. The dilemma remained how to rally the coalition without drawing the US deeper into Syria's war, they said. Concerned about the "growing flow" of jihadists, leaders at the G20 summit agreed to step up border controls and aviation security, according to a draft statement seen by Reuters and expected to be released later on Monday. They condemned the Paris attacks as "heinous" and said they remained committed to tackling terrorist financing. "We agreed that the challenge cannot just be tackled militarily, but rather with multiple measures," German Chancellor Angela Merkel said, adding this involved intelligence service cooperation and surveillance of online communications. Turkish President Tayyip Erdogan urged leaders at a dinner on Sunday to deepen information sharing and said leaders in the Muslim world must do more to break the perception that terrorism is affiliated with Islam, presidency sources said. Turkey has come under pressure from Western allies to ramp up its fight against Islamic State and tighten control of its 900 km (560-mile) border with Syria, which the jihadists have used to bring in supplies and foreign fighters. But it has long complained about a lack of robust intelligence sharing and urged the West to provide more information about potential suspects before they travel. Leaders at the summit also affirmed that terrorism should not be associated with any religion, nationality, or ethnic group, according to the draft document. "I was surprised how determined the leaders were not to confuse refugees with terrorists," one senior EU official said, noting the statement had already been in the works after twin suicide bombings in October in host Turkey's capital Ankara. "What happened in Paris only strengthened the language."